Already done a scavenger hunt? Need a new idea? We love fresh new corporate team building events that we can offer our clients! Here’s two ideas that are definitely NOT your traditional team event and perfect for Orange County, Anaheim, or Los Angeles. Move over Banksy! NO ARTISTIC SKILL NEEDED! Want a group activity to break-up the powerpoints? Let them experience the thrill of creating a new memory through graffiti. Our graffiti lesson focuses on the the act of creating a masterpiece. Your team will get a lesson from our world class graffiti and street artists. They’ll learn about flares, fades, and can control. Then they’ll combine efforts with the artists to create a gallery worthy work of art. It’s a fast, fun, and rewarding team event that they’ll talk about for a long time. Want to add some excitement to the work day or conference? We’ll put your team in front of advanced weapons simulators & tactical training session. Drop them into an adrenaline charged scenario and let them take care of business! How will your team stack up against our virtual assailants and adrenaline spiking scenarios? Looking for a venue for your team building event in Orange County? We typically look for locations that offer a change of scenery, good access to facilities like restrooms, parking availability, and minimal travel time to reach it. Here are 3 venues or locations that are perfect for Orange County team building events. With it’s sprawling resort layout and oceanfront placement, we love playing at the Hyatt. There are 2 main lawns that are perfect for large and small group team activities. Larger properties like the Hyatt also work well for our team rallies. The staff at the hotel is always happy to help with clues, customer service and they treat their guest like locals. A bridge spanning Pacific Coast Highway connects the resort to the beach. From volleyball tournaments to an Iron Team Challenge we love getting groups on the sand. Laguna Beach offers the perfect backdrop for our Throwdown Rally and other team events. Its adorable shops and world class art galleries give us plenty to work with when we build our scavenger hunts. Wrap up your team building event in Laguna by celebrating at one of the unique local restaurants and bars. It’s a quiet village by the sea and is great for large and small groups. Nearby accomodation includes Hotel Laguna, The Montage, Pelican Hill, and The Ritz-Carlton. If you need space for your team event we highly recommend Irvine Region Park. It’s snuggled back in the hills of Orange county but only minutes off the freeway. We’ve hosted large and small groups here. There are clean restrooms, parking, water fountains, and lots of great shade trees to keep your group cool in the sun. Corporate team building events in an outdoor park setting helps support the local community and can invigorate your group the way a city can’t. Take a deep breath, feel the sun on your face, and find out what events we can offer your group. Welcome to the Original Surf City! Huntington Beach is a beautiful location for team building in Orange County. It’s not just because they’ve got gorgeous beaches. You’ll find the tourist friendly local culture perfect for your sales conference or company meeting. Venue or activity space is a huge consideration with team building events and you’ll find plenty in this seaside town. The 4 most common team building venues we work in are Hotel Event Spaces, Beaches, Parks and Downtown or Pedestrian areas. Thanks to the beachfront Waterfront Hilton, The Hyatt, and the Shorebreak Hotel there are some beautiful resort settings for your team event. We’ve produced events in their conference rooms, lawns, and ballrooms. Hotels have the built in advantage of easy access to amenities like catered food and drink and customer service. The staff at all three of these locations treat everyone like a local so you’ll feel right at home. Want to move offsite? Walk across the street, historic Pacific Coast Highway, and you’re at the beach. Unlike south county beaches, we can accommodate any size group on the sand in HB. They are perfect for our Adaptation Event, team olympics, group excursions, and beach specific activities like sand castle building competitions. 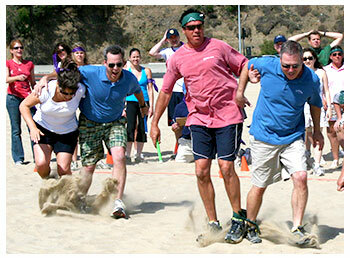 If you don’t want sand in your shoes Huntington Central Park is a fantastic location for team team building events in Orange County. The beautiful tree lined walking paths make a great playing field for our Reality Rally, Iron Team Challenge, or a round of frisbee golf at their world famous course. Huntington Beach has a quaint beachside main street and pier area that we’ve used for some crazy fun team scavenger hunts and Throwdown Rallys. Your group will have a great time hunting for clues, chasing points, and trying to outdo the other teams on the streets of HB. This is not your typical list of items to find. Get ready to complete team challenges, hunt for photos, gather strategic items, and race the other teams to the finish. We’ve taken the traditional scavenger hunt and AMPED it up to really challenge your teams. We’ve include both physical and mental elements and there’s no way you can get everything done. That means you’ll have to strategize with your teammates to decide where you’ll concentrate your energy. This is an active challenging way to get out the office for some fun in the sun. Our favorite spots for this type of team building event are downtown Laguna Beach, Third Street Promenade in Santa Monica, and the Gaslamp District in San Diego. BUT we can put together a similar event in almost any location.